Are you sick and tired of algae in your tank – green spots on the glass and decorations? Neritina natalensis snails will do all the dirty job for you. They eagerly feed on hard Chlorophyta and at that they don’t touch the tank plants. But more and more different popular kinds appear, which differ mainly in appearance. Zebra nerite snail and other kinds have rather short lifespan – about a year. Their size may vary depending on the kind, but is Nerite average size is about 2 cm. 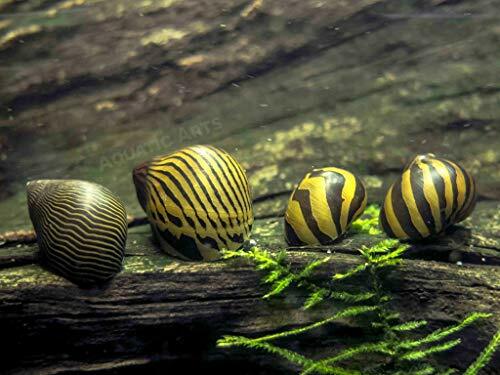 The largest are zebra and tiger nerite snails – their size is about 2.5 cm. It’s impossible to describe their coloring clearly since there quite a lot of species. The coloring may vary – it can be black, dark brown, dark green, olive etc. Sometimes their shells have stripes, spots, stains and the shells themselves may have kind of horns. Any closed tank starting from 5-8 gallonscapacity with will do for keeping a snail. If a tank doesn’t have a lid snails can easily run away. The following water parameters are recommended for keeping aquarium snails: pH 7,0-8,8, gH 6-28°dGH , kH 6-20°dGH, water temperature 20 — 28 °С (22-25 °С – optimal temperature). When keeping snails in more soft water, their shell softens. Nerite snail is a freshwater snail, however it can also inhabit in a bit salty water. Aquatic snails are completely not demanding in care and it can be kept even by beginners. Don’t put nerite snails in a new aquarium, since green algae is the only feed for them. Fish tank snails eat even the algae that can be removed from tank walls only with sharp metal objects and luckily, nerite is totally indifferent to any tank plants. Nerite snail and others can live almost in any tank, just keep in mind the problem of overpopulation. For example, in a tank of 5 gallons capacity one can keep only several young Nerite snails but not more – there is little feed, not enough space, water parameters can vary greatly. So, the same rule works here as it is for fishes – the bigger is a tank, the better. However, small number of these snails can successfully inhabit even is very small tanks. Nerite snails famous feature is their appetite to algae. If there isn’t enough algae in a tank they may starve and die. They really clean tanks. 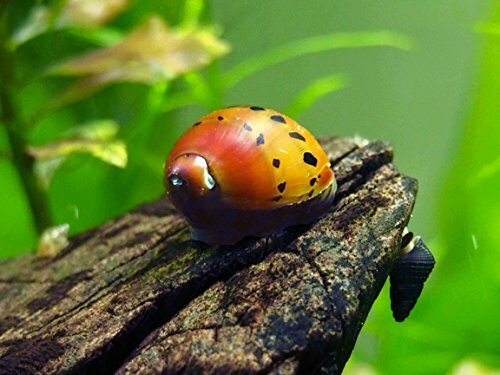 This kind of snails – is an ideal aquarium inhabitant: it feeds on algae fouling on tank walls, snags and stones (soft film algae, soft green algae, soft brown algae, and brown diatoms), however they don’t feed on tank plants. Except algae, Nerite snail diet can be complemented with TetraVeggie Algae Wafers. The only trouble is that they tend to run away from the tank, therefore it has to be tightly closed. Breeding nerite snails can’t be performed in a tank. It’s considered that salry water is required for successful growth of their eggs, though it’s rather doubtful since some species live in highland lakes and there are lots of miles to the sea from there. So, nerita are caught in their habitats and i then mported. They usually lay eggs in plants and bottom substrate. This fact is their only drawback, but it’s rather sufficient one. There are lots of eggs and they look like small white spots which are on glasses, plants, decorations and substrate, and therefore they spoil the look of a tank. What can be done to avoid this? It has been noticed, that if there are some Neritina natalensis snails in a tank they start breeding intensely to get an optimal number of species in population. Totally safe for live plants, live shrimp, and live fish. Nerite snails are widely known as one of, if not the most, voracious algae-eaters out of any snail. But if you raise the number of snails simultaneously living in a tank, they will stop laying the eggs. They noticed that population number is ok and stopped breeding. 15 snails are quite enough for 40-50 gallons tank and they won’t leave these white spots anywhere. It looks like 10-15 snails is a minimum number for a small capacity tank. So, the more snails (not necessary of the same kind), the better. Neritina turrita [Chemnitz, 1786] — Tiger snail, Tiger Neritina. Synonims: Neritina semiconica , Neritina strigilata. “Tiger Nerite snail”, “Tiger snail”, “Striped Nerite snail”, “Turreted Nerite”. Tiger snail comes from South-East Azia. It comes from Neritidae family, the majority of its species are perrywinkles. Tiger snail is an exception. Its shell size is about 2.5 cm. It has rounded shell with dark orange vertical stripes (which color may vary up to light brown) and dark brown or black stripes on a top of the shell. Nowadays, there are species with thick stripes and a number of thin ones, they can have zig-zag or dotted look (all black and orange colored). The main advantage of this spineless species is its appearance. Very seldom two snails will have the same shell pattern. Black stripes on light-brown background may be of different thickness and shape. These snails are compatible with the majority of fishes, but surely they can’t be tank mates for those fishes which feed on shellfish. Anyway, the tank water should be hard enough (dH 8-12º), otherwise their shells start wrecking. Since lots of snails on sale already have damaged shells and it brings us to the question – how dangerous it is. Having small damaged areas on the shell the snail will be ok, but these damaged areas won’t recover. Higher pH level can be important for snails shell development. Lower pH level can get the snail to complete damage of its shell and death. Except water hardness, nitrates and phosphates concentration is also important: from old water snails run away more eagerly, than from the fresh water. But if a big volume of water was renewed these snails get stressed and feel uncomfortable. Optimal water temperature is 22-26°C. Neritina natalensis Zebra. Neritidae Family. “Zebra snail”, “Zebra Nerite Snail”. “Zebra Algae Eating snail”. This snail is spread in Somali, Kenya, Tanzania, Mozambique and South Africa, it inhabits in mangrove swamps and lagoons. Grown up snail is 20-23 mm high and the shell is of 19-23 mm in diameter. External edge of its shell is S-shaped, the lower one is embowed. The shell coloring varies from greenish-yellow to yellowish-brown. This snails shell has curved wide black stripes on it, they go aslope down and forward, sometimes they are zig-zag shaped. In front there is not so many stripes and there are big areas of yellow background. Their body is light gray or reddish and yellowish. Cat’s eye shell is curved a bit, milk-white colored, it has a small deepening in its center and it’s limited from above and below with rather sharp teeth. Also these snails are on sale named Neritina natalensis Zebra, but their shell patterns and coloring are so different, so it’s quite possible, that these are Neritina snails of different kinds. As the majority of Nerite snails Zebra one is a perfect algae feeder. They can runaway from the tank, especially if they don’t like something in water parameters or other tank conditions, though they can harmlessly stay out of the tank for a while. Salty water is needed for Zebra snail breeding, therefore all these snails are imported. The optimal temperature is 22-26°С.